Food trends are funny things. Just a few years ago, I didn't know anyone who ate much kale, cooked, raw or otherwise. Today, it's everywhere. On my annual In and Out list, I've tried to declare it "out," but what's the point? People may say it's "out," but they're wrong. It is as popular as ever. And that's not necessarily a bad thing, since kale is really good for you. It's often considered one of the super foods, loaded with vitamins, fiber and even protein. There are different types of kale. Curly kale is the most common. I like it best cooked. 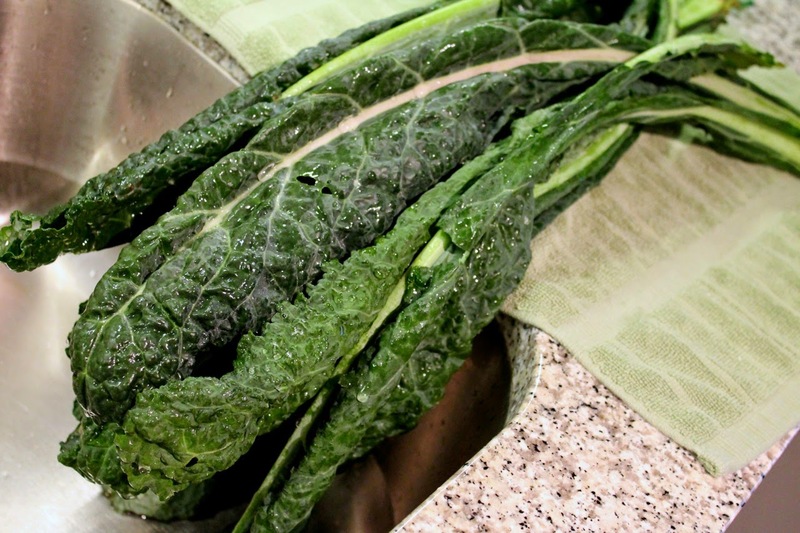 For salads, I prefer lacinato kale (also known as "dinosaur" kale), which has dark green smoother, less fibrous leaves, making it both easier to chop and to eat. This beautiful salad of classic fall ingredients was inspired by the new Logan Square salad at D.C.'s chain of gourmet Italian sandwich shops, Taylor. Taylor has long had a range of pasta salads made with large couscous-like pasta pearls they call "pasting." Recently, Taylor has branched out into new salads, including seasonal offerings like this salad. You can serve this salad as is or add grilled chicken. 1. Whisk together the dressing ingredients and set aside. 2. Heat a small frying pan over medium-low heat. Add the pecans and toast until fragrant, tossing occasionally, about 5-7 minutes. Set aside to cool, then coarsely chop. 3. 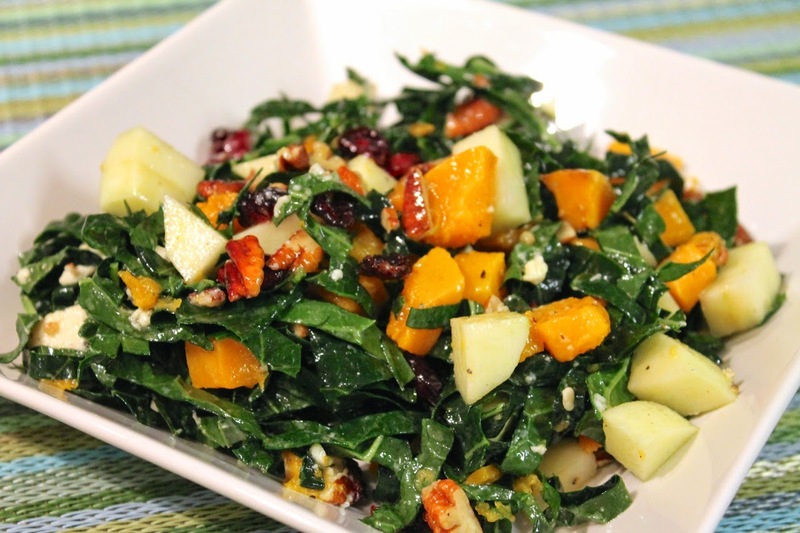 Combine pecans, kale, squash, cranberries, apple and blue cheese in a large bowl. Add the dressing and toss to coat. Serve with chicken breasts if desired. Note: To roast butternut squash, preheat oven to 475 F. 1. Toss 2 cups cubed butternut squash with 1 tbsp. olive oil and a pinch of salt and spread in an even layer on a baking sheet. Roast for 15 minutes, stir squash and roast an additional 15 to 20 minutes until cooked through and lightly browned. Set aside to cool. Note: To make the chicken, heat 2 tbsp. olive oil in a medium frying pan over medium heat. Add 3/4 lb. chicken breast cutlets. Season chicken with garlic powder, dried oregano, salt and a pinch of red chili pepper flakes. Sauté until cooked through, about 10 minutes, turning chicken halfway. Transfer to a cutting board and slice into strips. I love how bright and colorful this salad is; it looks so inviting and delicious! Thanks! I don't always set out to make something pretty, but it's nice when it happens. I'm so glad I found this. The Logan salad at Taylor's was a winter menu item, and not it's no longer available! I adored that salad, and now I'm going to try making it myself. I'll look forward to this coming back at the end of the year, although I love that Taylor rotates their salads and has really good seasonal offerings.